So what is your favorite garden tool? A trusty weeding hoe? Maybe a favorite shovel or rake? Perhaps i’s an old tool passed down a few generations from grandma or grandpa? One thing is for sure, gardeners love their tools! And when we received Trisha Smith’s email about her favorite, we loved it so much we decided to make it one of our features. Trisha hails from just outside of Hartford, Connecticut and is a long-time avid gardener. And, she simply loves her Hori Hori, the multi-purposed gardening tool with a funny name. If you have never heard of it, the Hori Hori is a gardening knife that can make quick work of all kinds of garden chores. After reading Trisha’s email and doing a little research on-line, it seems this little tool has quite the beloved following among gardeners all around! It never ceases to amaze us how many gardeners like Trisha love to share their gardens and gardening advice. Ever since starting This Is My Garden, we have been treated to so many great stories and advice from fellow gardeners. Hopefully, it only keeps getting better! We love showcasing home gardens and garden tips from gardeners around the world. So don’t be shy! Share your garden or advice today using our easy submit button on the website. You could be our next featured guest writer! Now let’s let Trisha tell us below why she loves her Hori Hori garden tool! I just wanted to share with you and perhaps your readers my absolute favorite gardening tool. It’s called a Hori-Hori Garden Knife. Yes, it has a funny name, but I have to say I don’t know what I would do without it. You talk a lot on your garden websites about working smarter and not harder, and this tool helps me do that! About 5 years back, a friend of mine introduced me to the Hori-Hori knife. She was weeding her garden, and I was amazed at how easily she was just popping weeds out of the ground. By the time she was done telling me how many other things she used it for, I couldn’t wait to get my own! I thought the name was actually pretty funny. She told me that Hori was Japanese for “dig”. So, it basically means dig-dig. Actually a great name for how well it does that chore! But I also use it for so much more. I personally love it most for planting bulbs in the spring and fall. 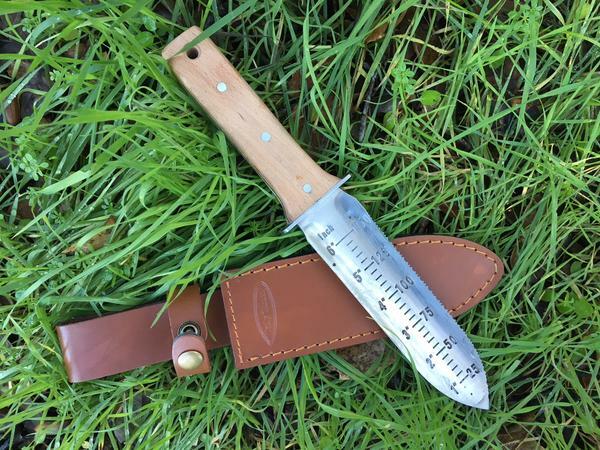 The knife has inch markings right on it, so it makes it easy to get the hole depths perfect. I just plunge it in the ground pull it back a bit to make room for the bulb, and plant. And it really is great for weeds, especially ones with the long roots. One side of the knife blade has super sharp cutting teeth, so you can use it to slice or saw through roots and even twigs. It is great when I need to prune off damages or wild parts of plants. I also use it to cut string when I am tying up things in the garden. It’s really easy to carry around as well. I don’t know all the particulars about the blade, but I do know that it is some type of stainless steel, so it never ever rusts. I’m not sure if you had ever heard of it, but I thought I would pass it along. I saw your article on tools on the Old World Garden Farm site, and thought this one would be a perfect one to talk about on this one. Share Your Garden Tips With The World! Thanks so much Trisha for the Hori-Hori tool tip. We are going to have to try one for sure now! Do you have a garden tip you would like to share on This Is My Garden? Whether it’s how to grow roses, or the secrets to growing vegetables, fruit trees and more, why not want pass it along to fellow gardeners here on the site! Email us today at info@thisismygarden.com and let us know your favorite garden tip or story. You can also use the “Feature My Garden Tip” button at the top of the website to submit your entry. Help make This Is My Garden the best garden site around and share your garden knowledge with fellow gardeners! This post may contain affiliate links. I’ve seen those and often wondered if I’d like one or not. I’ve put it on my “wish list”. It does indeed look handy. I have used a Hori-Hori for years and absolutely LOVE it! When I bought it, I bought one each for my two sisters. Strange looks I got. Now they use it all the time. Just got one last month. Already a favorite, go-to tool!